I seem to have a never-ending supply of things I want to print and try. Here’s another one for my formidable list! Today I read a Make magazine article entitled “Automating a Filament Colorizer to a 3D Printer” (via the 3D Printing reddit). 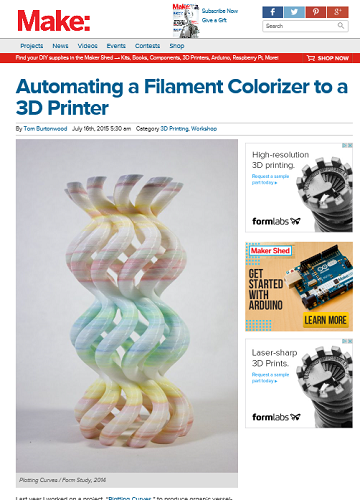 As soon as the article loads, you see a lovely piece of 3D Printed art by Tom Burtonwood that is sporting gradients of multiple colors. I marveled at the piece, scrolled down and was shocked to see how he did it. He used Sharpies! We have a ton of Sharpies in the house! I’m quite familiar with their vast array of colors as I have to routinely confiscate them from my four year old (and try my best to convince him he wants to use “kid markers” instead). And although I once doodled with a Sharpie on a 3D Benchy print, it never occurred to me to take that Sharpie to the filament before it goes through the printer. It’s an interesting notion. I might have to give it a whirl one day.